This year I helped coach an Odyssey of the Mind team so that Cort and Reid could participate. They were on a primary team (first and second graders, judged but not scored). Their problem was called Movin' Out and they had to make a scene that could change when the characters moved from one scene to another. Pierce's team did a problem where they used two famous works of art and looked at them in the past and in the future. It was a long day and the boys' competitions were close together, so I forgot to take pictures! I was just focused on getting people to where they needed to be, and costumes. I only took one picture. At one point we were walking down a hallway by a science classroom (the competition was at a high school) and Pierce stopped me, pointing to a cartoon on the door. I confess, I stood there blinking at this cartoon for a minute, at a complete loss. "MOM! Don't you get it?" "MOM! Resistance is measured in ohms! That's something I learned studying ham radio." Me, shaking my head in dismay at my shortfalls: "Ohhhhhh! I get it now! That's cool, Pierce." Pierce's team didn't place this year, and they were disappointed, but they still had a great day. All of the other kids on Pierce's team are headed to middle school next year, so he will have a new team I guess. Cort and Reid loved doing OM and can't wait to be on a secondary team next year. 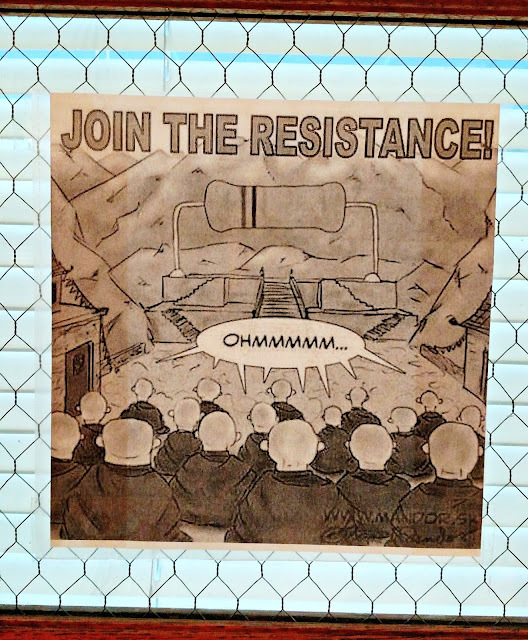 Readers, did you know that resistance is measured in Ohms, or is it just me? We have a persimmon tree that self-seeds fairly easily, so we told a neighbor he could come dig up some up the small trees and try to transplant them on his property. When he started digging, he got more than he'd expected. Turns out the hillside where the persimmons are growing was a dump site for the old homestead that used to be on our property. 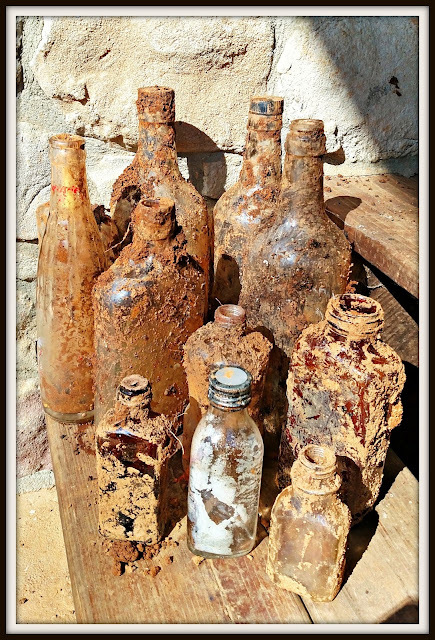 He dug out a number of bottles from under the tree roots. Many were broken (there were a few old boots in there, too), but some where unharmed. I have only cleaned up the front center bottle, with the white residue inside. It has Norwich on it, and is an old Pepto Bismal bottle. Once I get time I'll clean up the others and see what Google can tell me about them. Several appear to be liquor bottles, and one at first glance looks like Pepsi to me. Hard to say what else has been buried on our land all these years. Prior to us moving there in 2000, no one had resided in the old (now torn down) house since the mid 70s. Last year when we did that overnight backpacking trip with the boys, a big storm blew in and blew a fuse in our electric fence. The horses got out and were running all over, and no one could reach us because we were in a region where there was no cell phone service. Once we found out, we drove the two hours home, and I was terrified for the horses the whole way. I already knew that Phoenix was limping. Luckily, I was able to get them home (they were about a mile away from our house, up a mountain) and Phoenix's injury, while painful, was treatable. I NEVER want that to happen again. So I've been saving every cent I get from Christmas or selling stuff online towards building at least one very secure pasture. With no electric! That means three board fencing for most of it. With the cost of wood right now, it's a pricy endeavor. We've been working on this stretch since Christmas. We hit a number of obstacles, including a broken nail gun, a post hole digger that didn't want to run, and post holes that dipped into an underground stream and were filling with water. Not to mention all the rocks we had to dig through! Happily, we now have a big stretch done. This pasture already has wood fencing on two other sides. So now three sides are fenced with wood. We only have the back stretch left. 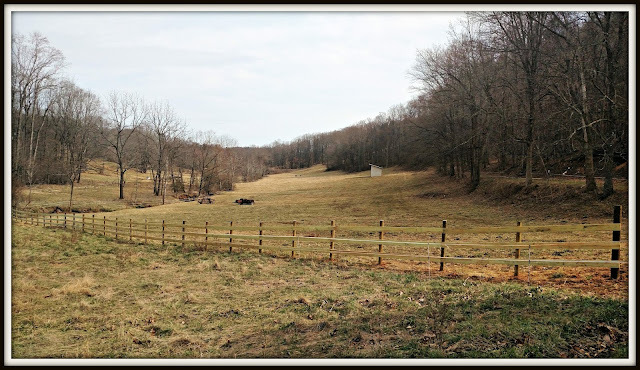 Because the final side is by a river (and may need adjustments as a result), and cannot be seen from the road, I will probably try to use high tensile fence wire with a mixture of wood posts and t-posts. It should go in easier than the wood (with having to dig less holes) and hopefully will be cheaper. After that's done, I will start saving again - I still have a couple of other stretches of wood fencing I want to do. I do love seeing the fence lines once they're done! If you have a truly excellent memory, you may recall when Pierce made a pyramid from Legos for Social Studies in second grade. Cort and Reid have reached that point in their studies. Both of them were eager to start their pyramid project. The only guideline was that it had to have a square base and four sides. I think they each wanted to do something unique. Reid decided to work with Sculpey clay. He created a little scene with two pyramids, including lots of pots and treasure. 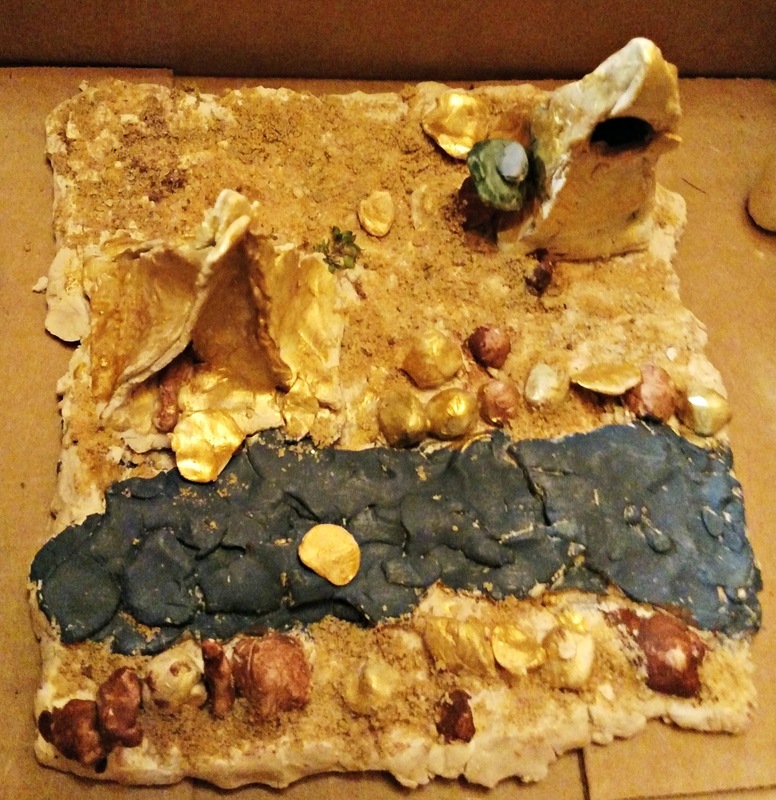 He even made the Nile river. We baked it in the oven and then after it cooled he painted it with acrylic paints. On the base piece he painted Elmers glue and then sprinkled sand from his sand box over it. He spent a long Saturday creating his scene to perfection. 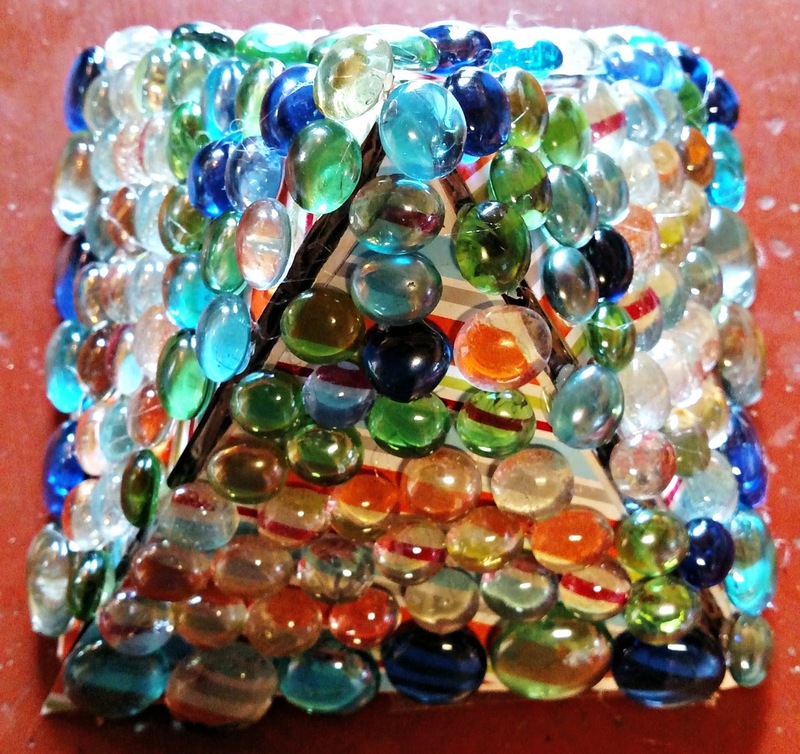 Cort is really into rocks and gems, so he decided to build his pyramid from cardboard and then hot glue "gems" to it. He also glued a layer of bright patterned paper before putting on the gems (which I got from the dollar store). He made a pyramid that really POPS. They were both really pleased with the results, and couldn't wait to present them in school. Readers, how would you make a pyramid?